We believe that music should last a lifetime! UNI CMS offers classes for preschool children through senior citizens. All CMS events are held on the UNI campus in the UNI School of Music facilities and other appropriate area community sites. Private lessons are offered on an individual basis to beginning through advanced students. Lessons are given year-round and students may start at any time during the year. Music theory basics and the development of technical and musical skills are included in lessons. 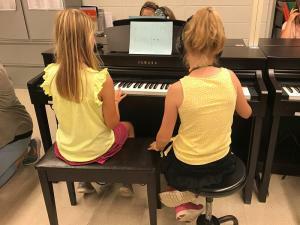 Fall and spring recitals, as well as, preparation for festival participation are included in the lesson fees. Classes meet once a week, on Tuesday, for four weeks. UNICC is a performing vocal ensemble that provides an opportunity for children to make music together, further vocal development and perform high quality concerts. 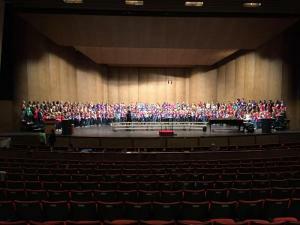 The choir performs two concerts per year as well as other arranged performances throughout eastern Iowa. Loving to sing and having fun are prerequisites! Meets: Tuesdays from 6:30-7:45 p.m.
UNI New Horizons Band is for adults who love music and want to play in a concert band. Members range from beginners through advanced players. The band presents a winter and spring concert, as well as, concerts during the summer season. Rehearsals: Tuesday and Thursday mornings. 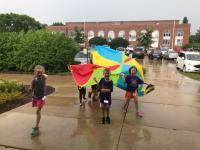 Group lessons at 8:00 a.m.
Full band rehearsal at 9:00 a.m.
Social hour at 10:00 a.m.
Camp Musicmania will focus on Orff activities for 1st-4th Grades. Upper elementary and middle school ages will focus primarily on the presentation of a camp musical. All campers will be involved in music and movement activities , singing, dancing, drama, and art as well as the camp musical. Parents and friends will be invited to the final performance on the last day of camp. Campers need to bring a sack lunch. Snacks will be provided.